A Summer Hair Cut? Nope. This is not to say that thick-coated dogs, like me, can’t overheat, because we can, but cutting off all my hair would be WORSE because, then, since I don’t sweat like people do, I’d REALLY overheat if I cut off all my hair. See? Here’s something else, water helps us cool off, too. Why just the other day, I figured out that if I DON’T avoid the garden sprinkler, and stand right under it, it’s pretty cool under there. So, call me slow, but I really like to stand under the sprinkler and get a good covering of water. Some dogs have wading pools. That helps, too. OH! And you can get one of those neck bandana things that hold those little crystalline beads that swell up when you put them in water and then, see, you can tie that around your pooch’s neck to help her cool off, too. Dogs don’t perspire like people too. We pant and sort of sweat through the pads on our feet. Please don’t cut my hair off in the summertime! Don’t worry when we pant. That’s how we cool off! Keep us out of the direct heat of the sun at the hottest point of the day please. If we have to go out during the heat of the day, we find shade. Spray us with a hose to cool off! Be sure to have clean, fresh water outside for us. Inside, too, for that matter. AND NEVER LEAVE US IN A CAR in the heat! Check out this website for more heat tips. Apologies to my friends Down Under. I know it’s not hot now where you are. 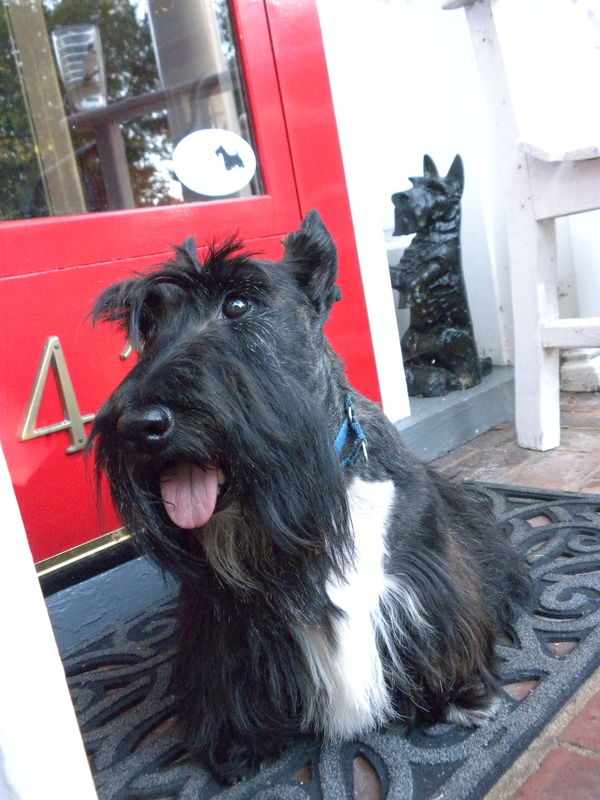 This entry was posted in The Scottie Chronicles and tagged keeping dogs cool in the summer, My Dog is Cool, why do dogs pant. Bookmark the permalink. 19 Responses to A Summer Hair Cut? Nope. Oh my, I would never get shaved for the summer. If you happen to get shaved remember dogs, just like our peeps, need sun screen too! That is SO TRUE! We were talking about this with Godmother Carol. About sunscreen. Thanks for the reminder. and have forgotten who is REALLY dnvriig this vehicle that we identify as Me. these teachings are like road signs on the road back home. this book, Raja Yoga, is rich with value. like all things, the teachings found in this book cannot be objectively valued; the Candidate (one who would seek teachings such as these) must find the value for him/herself. for me, these teachings cannot be compared to anything else that i’ve been taught. i’m getting to know myself on a much larger level. i am sooo thankful for these teachings. the value is in the fruits of doing the work. i highly recommend this book for anyone who feels drawn to read it. follow your instinct your first inclination is often the most sincere one. also, take your time with it Rome wasn’t built in one day. Great scott you look cool as can be in the hair department..so cool you should wear shades. we need a trim too but might just do with a bath..ugh!!! the heat here is unbearable…but we are all out in the dirt yard in the shade..I guess you could call us 4 “redneck”‘ yard dogs right now..but we do live in Georgia and when it’s hot, we show no class.. When it’s hot, who cares? Stay cool you guys and gals! OH EDGAR! I’m sure your peep cuts your hair just a bit shorter and doesn’t give you a summer buzz. Now, about your itchies. Have you examined your diet? Some of us scotties have skin allergies that can be caused by what we eat. And you KNOW we all hate those bug bites. Talk about that with your vet, OK? I don’t want to see tufts of your fur all the way over here where I live! Let me know what happens. Edgar, excuse me for jumping in on this, but have your peeps tried dabbing your itchies with organic apple cider vinegar. I don’t like the taste so I stop pulling fur and it cools my hot spots when I get them. And it can’t hurt you. My peep got that from a holistic veterinarian and it really helps me. when I get my haircuts, she gets me the short summer shave. I dont mind cuz it keeps me cool!! Are you really shaved Miss Jazzi??? Great cooling off ideas. We usually stay inside with the A/C going. But getting hosed on a hot day just makes us zoom around chasing each other…..so we do that on warm evenings. We just have the same hair style all year around. Zooming around chasing each other sounds like loads of fun. Especially when you can cool off inside with the AC. I have the same hairstyle year round, too. Ooooh, big argument in our house. Kenzie is Her dog and She tells the groomer to cut it short in the summer. Kenzie once even hid under the bed for a week except for food and potty because he was so embarrassed. I’m groomed according to His instructions and He tells the groomer to give me a normal cut. I do pant and so on, but we wonder about Kenzie who goes outside and tries to sunbathe (at 110 in the June Arizona sun at noon). I stick to the shade. Most of the time we’re indoors but when it is pool time-we’re there. Kenzie even has his own raft (a couple of Fotofun Fridays ago shows him). OK. Now I’m officially worried about the surfer dude Kenzie myself. SUNBATHING in the HEAT???? You better take care of him Kyla. He’s liable to hurt himself. Dad just commented today that he thinks I need another trim! I think we need to move to cooler temperatures.